Warning: This will stop streaming on May 26th so act fast! Yesterday I talked about how much I enjoyed documentaries about mundane topics. This is not one of those documentaries. This is one of those documentaries that slaps you in the face and shows you how f***** up and evil people can be. 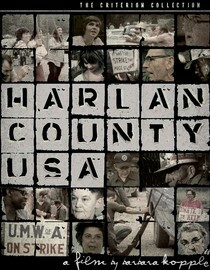 Harlan County, U.S.A., is about the coal miners strike in, you guessed it, Harlan County, Kentucky. For those of you unfamiliar with the history of the relationship between mining companies and miners in Harlan County, it's awful, bloody and downright gruesome. In the 30's guerrilla warfare actually broke out between the two factions and while things weren't quite that bad in the 70's, it still wasn't pleasant. The head of the company was actually convicted of murder for ordering the death of a union leader - and his entire family. All of this because the workers wanted to join the United Mine Workers of America so that they might get a contract that included things as luxurious as say, bathrooms and and indoor plumbing at the shacks they had to live in on company property. These people fought and died for their right to unionize and when you look at that through the lens of our current political climate in an age where corporations are allowed to do anything they want and workers have no representation - it looks like their blood was shed in vain. This is an important documentary for us all to think of. Just to be reminded of what the profit motive is capable of if left unchecked. Everyone should watch this to see how far we've come, and in some ways, how far we've regressed. Why is it in your queue? I've heard it's a classic documentary and I can see why. Is it artsy? No, but it is incredibly confronting. What stood out the most to you? The depths of depravity the mining company would sink to. What mood should I be in to watch this movie? Ready to get a glimpse at the darker side of corporations.